Is it Stew?, Chowder?, Bisque?… SHARI’s CRAB SOUP. Call it what you please… A true treat your body (and taste buds) will love. I was in the mood for some crab bisque but traditional crab chowders and soups are loaded with saturated fats and calories from a combination of whole milk, canned creamed soups, butter and then more heavy cream. With some very easy substitutions, I was able to prepare and enjoy a hearty, satisfying soup, without the excess calories. The secret: thicken the soup with a little corn and whole wheat flour! And the best part: IT’S EASY TO DO and ready to eat in about 20 minutes. I promise you will not miss all those calories and fat. What?... a healthy "cream" based soup . You won't miss the calories and fat. Heat olive oil in a medium sauce pan. Sauté diced potatoes and green onions until slightly browned over a med heat. Add the flour, creamed corn and 1 tbsp of butter stirring constantly. This will thicken and make a nice roux. Reduce heat and gradually stir in the milk (1/2 cup at a time), the chicken broth, and spices. Heat and stir, to just before the point of boiling. Use a whisk if you prefer to prevent clumping and better blend the sauce. Once all liquids have been added, stir in the crab meat and continue to stir. Heat all the way through until hot, but not bubbly, stirring frequently. Add sherry and hot sauce (if desired) just before serving. I prefer my soup on the peppery side but adjust seasonings to your personal taste. I make this recipe year round – even during contest prep! Tilapia is a very lean protein source, low in calories and contains NO carbohydrates. Add Southwest spices and pan sear in olive oil. Serve in a low carb, whole grain tortilla, & add desired toppings. Dinner is served in less than 15 minutes! Complete High Protein/low carb meal in 15 Minutes.! 1) Heat Olive oil over med-high heat in non-stick pan. 2) Add fresh or thawed tilapia filets. Season generously with Southwest seasonings, cumin, cilantro and squeeze of lime. 3) Cook approx 3-5 minutes, depending on thickness of fish. Flip filets when golden browned and season other side until browned on both sides. Remove from Heat. 5) Fill Tortillas with 3-4 oz of tilapia and add desired toppings. Tilapia is an excellent lean protein, is low in calories and contains no carbohydrates. How Healthy is Shrimp, Really? They may be small in size but shrimp is one of the most nutrient dense foods. Shrimp is rich in several vitamins, especially B3, B12, and vitamin D, as well as having significant levels of omega 3 fatty acids. The proteins in shrimp are incredibly high-quality and low in fats, and a serving of shrimp contains significant levels of copper, zinc, magnesium, iron and phosphorus. Very low in calories, high proteien, no carbs and virtually no fat. What’s not to love? Shrimp is an excellent source of selenium, this neutralizes the injurious effects of free radicals which is the main cause of cancer and other degenerative diseases. Shrimp is a very good source of vitamin D. This vitamin regulates the absorption of calcium and phosphorus, which is essential for strong teeth and bones. Shrimp is a good source of vitamin B12. This vitamin is important for the proper brain function and essential for the formation and maturation of blood cells. Shrimp is also a good source of omega-3 fatty acids which reduce the risk of cardiovascular problems because it reduces cholesterol in the blood. Studies have shown that the high percentage of good fats in shrimp reduce the impact of cholesterol. 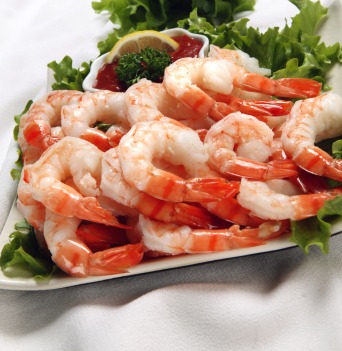 Although shrimp is a bit high in cholesterol, it is important to note that shrimp is especially low in saturated fat. It is now known that the amount of cholesterol in shrimp is about 130 mg per 3 oz of raw shrimp (about 12 large shrimp), there is minimal fat in the shrimp. The amount of cholesterol in an equivalent portion of regular ground beef is about 110 mg, and has about 20 grams of fat. Shrimp have high levels of valuable unsaturated fatty acids, which increase HDL cholesterol levels, which are the good cholesterol, so easting shrimp as a part of your diet can decrease your overall cholesterol. So… get cooking with Shrimp … Recipes to follow!